Before the Indiana Pacers season started, I made some predictions for the season. So, to hold myself accountable, here’s my predictions and a verdict for whether or not it came true. Prediction 1: Paul George will win the Comeback Player of the Year Award. So, I found out soon after posting the predictions that this award does not exist in the NBA! It was replaced with the Most Improved Player Award sometime in the 1980s. Verdict: Wrong. Nothing like predicting someone to win an award that doesn’t exist. Prediction #2: Paul George will average a career high in points. Paul George averaged 23.1 points per game in 2015-16 season. His previous high was 21.7. Very impressive to set a new career high in his first full season back from injury. 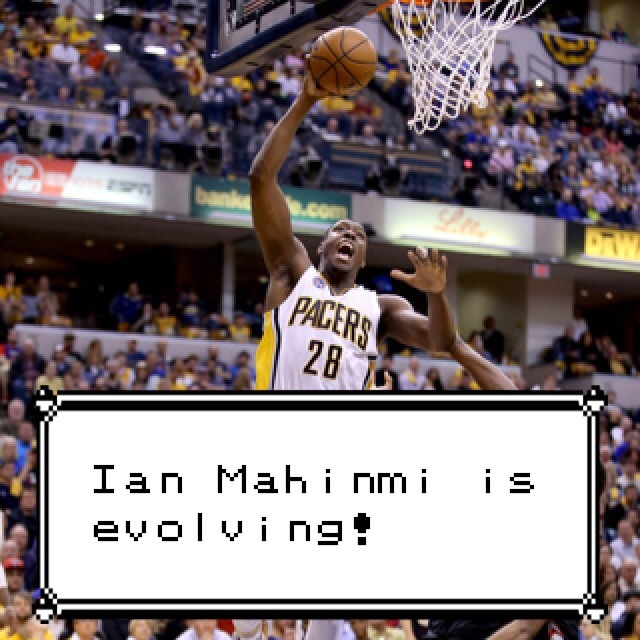 Prediction #3: Ian Mahinmi will average a double double. Prediction #4: Ian Mahinmi will shoot better than 50% from the foul line. After Mahinmi lost all confidence in his free throw shooting last year with a 30% average, he found his stroke again this year. It was still well below his usual mid-60s percentage, but after some Maul-a-Mahinmi intentional foul nonsense early in the season, Ian ended up at 58% on the year. Myles Turner made it easily, even receiving 28 first-place votes and may have even made the first-team if not for his injury that caused him to miss 20 games. I wrote about his rookie season a couple of places: here and here.This rookie class might be the best since the 2003 draft. The competition for these spots was great. Joe Young never had a chance since he was never really in the rotation. After it looked like the Pacers were going to let Young get the backup point guard minutes in the preseason, Vogel ended up going with a 3-man combo guard rotation of Monta Ellis, George Hill, and Rodney Stuckey that took care of any minutes at point guard. Young looked good in one west coast road trip that showed some hope for his future prospects, but often looked uncomfortable with both being a point guard and at times with the speed of the NBA game. Young did get one surprising vote for the Second Team, but many wonder if this was a mistake on the drop down menu. David Wesley, who works for the New Orleans Pelicans, gave Young his only vote. Verdict: Yes on Myles. No, no, no on Joe Young. Once again, I was way off with Joe Young. I still think Pacers fans will see him light it up at some point, but he clearly wasn’t ready for big time minutes as a point guard in his rookie season. Myles Turner and Joe Young both didn’t even get invited to the Rookie/Sophomore game. Once again, this rookie class was INSANE. Myles Turner averaged 1.4 blocks and had the smothered chicken heard around the world with his block on LeBron James, but in a quick search I found that at least Kristaps Porzingis and Karl Anthony Towns both had higher block averages than Myles. Verdict: Samsonite? I was way off! Monta Ellis ended up averaging only 13.8 points per game this season. It was his lowest since his rookie season when he scored only 6.8 points per game. Ellis had his moments this season, but whether it was his off-season knee surgery, a natural decline from age, or just taking a back seat to Paul George, Ellis’s scoring numbers were well below where they had been in his previous stops. Hopefully this first season with the team will be exactly like David West’s first as a Pacer: still recovering from an injury, steps up in important moments, and returns to level of previous play the next season. If this was the start of a steep decline for Ellis, that contract the Pacers gave him last offseason will be a burden on the Pacers salary cap for the next 3 years. Verdict: I didn’t go far enough with this prediction. Prediction #8: Monta Ellis will hit two buzzer-beaters for the win this season. The Pacers struggled in close games this season and this was especially true in late-game offense and final shot situations. The Pacers were something like 1 for 22 with less than 10 seconds to go and the game within 3 points. Ellis took plenty of those shots, but never connected on a shot for the win. There were a couple times during the season where it seemed Ellis chose to go for the glory with a bad, contested fadeaway shot instead of passing it off to a teammate. The glory never came this season. Prediction #9: The Pacers will finish in the top-10 in Offensive Efficiency. Well, if this ended up happening, the Pacers probably don’t let Frank Vogel go. The Pacers finished 22nd, barely better than the year prior when the didn’t have Paul George. Prediction #10: Solomon Hill will be out of the rotation completely by midseason. Solo barely played through the All-Star Break. The Pacers even waived his team option at the start of the year. Now that looks like it was a mistake after the Pacers found out how to use Solomon Hill well: as a small ball four. I talked about his season and even wrote a song about it. Verdict: Technically right, but in the end wrong. Prediction #11: The Pacers will make the playoffs with a seed in the 6-8 range. The Pacers finished 7th in the East though if it weren’t for numerous blown 4th-quarter leads the Pacers may have finished as high as 3rd. The Pacers nearly upset the higher seeded Raptors that now face the Cavs in the ECF. Prediction #12: George Hill will be blond through the entire 2015-16 season. Hill ended up getting rid of the Sisqo look after he became a father, saying that it took too much work to maintain. Thankfully, Blond George Hill now rests in peace. Verdict: Happy to be wrong about this one.